Have you been hit by a winter bug yet? We had one run its course through our house this weekend, and I'm officially saying Bon Voyage right now, so it better be on its way out. So sorry I missed you yesterday. Monday was just not as much fun without you. Never despair, I have some Itty Bitty Lovelies to delight you. No, no, no, not that kind. Pantone Matching System, silly!! You've seen the term thrown around in all sorts of posts and pins. And who can forget that emerald is the Pantone spring hue? Well, the lovely Leonora over at Yellow Heart Art has broken down the vocab to make the whole system approachable. Check out her super informative Pantone post. On my life list? Create my own font(s). Have you tried the Ifontmaker app yet? Until I get around to it, I've downloaded Anna's tip top handwriting fonts. She made four different styles, and they're all free. And, if my handwriting looked like hers, I would already have a font for sure! These alphabets will look great on photos and on their own. You may even see them around these pages. Thanks, Miss Anna of Dear Friend. Usually I'm admiring Jillian's bravery and adventurous spirit. But now she's amazing me with this easy, beautiful craft that kids and parents will love. Jillian in Italy shows us fabrics that charm, wraps them around circular cork boards and pops them on the end of a bookcase. Check out the fabulous result that I totally want to imitate. What a cute gift for your favorite tween or a teen headed off to college. 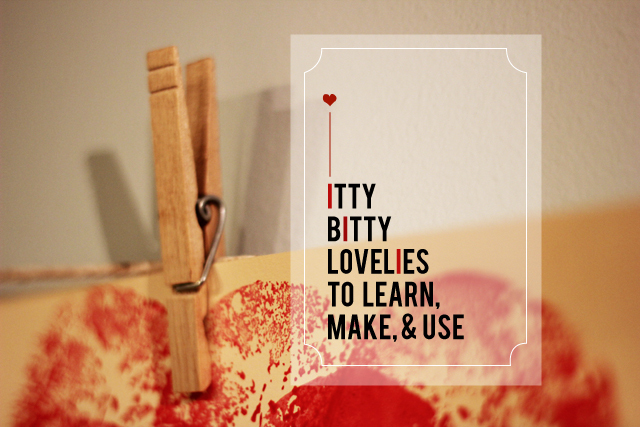 My Itty Bitty Lovely for the week is this: you don't have to leave it all behind. I was a full-time teacher for two years. I've taught a handful of classes here and there. My career path has taken me in a different direction, but part of me still yearns to be in the classroom. This weekend my husband (also a former teacher) and I had a chance to teach together, and it felt really good to be back in the saddle. It reminded me that even when we chose something different from where we've been, we can still carry on the goodness that remains and come back to it again and again. What are you bringing to this week? I'm excited to dig in.